How companies can implement Internet fair use policy for corporate users? Internet fair use policy or acceptable use policy defines the appropriate Internet usage behavior expected from employees in their workplace. The policy aims to protect the employees as well as the companies IT infrastructure from malicious threats, inappropriate content, and corporate bandwidth draining web applications, all of which ultimately affects the productivity and competitiveness of the company as a whole. To add tooth to the ‘written policy’ companies should have tools in place to enforce the policy in letter and in spirit. 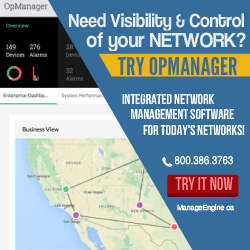 Companies use non-intrusive and real-time network security monitoring software’s like ManageEngine Firewall Analyzer to implement the Internet fair use policy in their corporate network. In this series of posts, we will show how companies use Firewall Analyzer to enforce Internet fair use policy. How to get the list of denied URLs and URL categories, each user tried to access and the list of allowed URLs and URL categories accessed by each user? 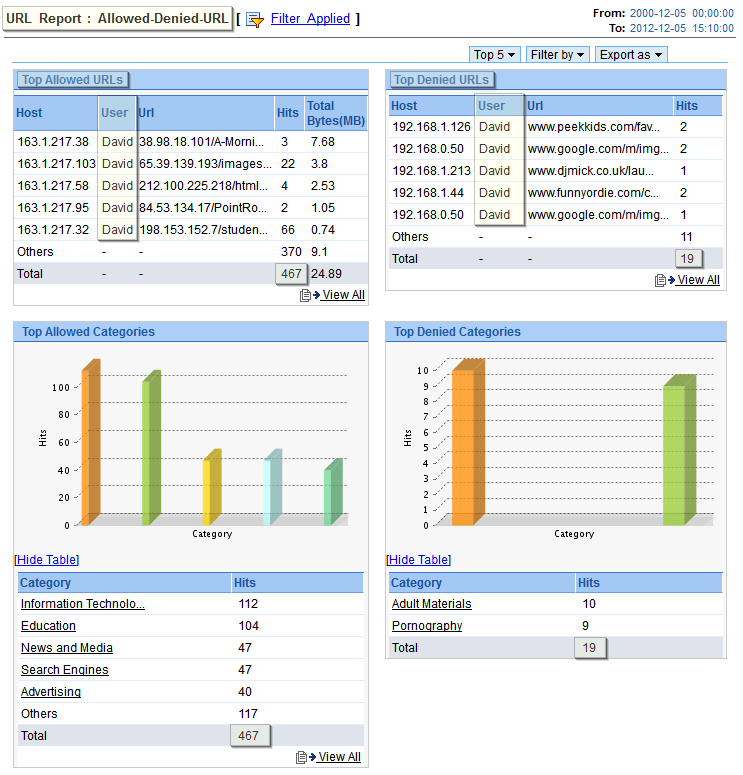 Using Firewall Analyzer network security administrators can obtain detailed reports on employees who have tried to access URLs, which are ‘denied’ as per Internet fair use policy. They also obtain reports on users who have accessed safe or allowed URLs. See how it can be get done and how your company can benefit from it. 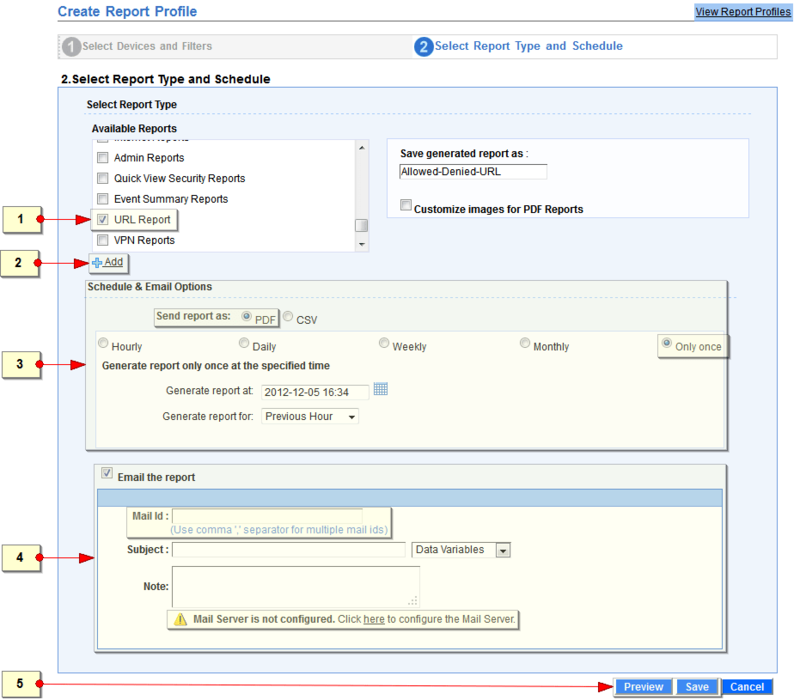 Create a report profile, which will generate a report, displaying the denied URLs and URL categories the user has attempted to access and the allowed URLs and URL categories the user has access. Use the ‘Add New > Report Profile’ menu available in the sub-tab. Enter a name for this report profile. This field is mandatory. Select the devices as per your requirement. Choose any of the filters from the existing list, which meets the denied URL report condition. If there is no such filter available, add a filter. Use the ‘+ Add’ menu link. Navigate to the next wizard screen. Use the ‘Next’ button. Enter a name for this report filter. This field is mandatory. 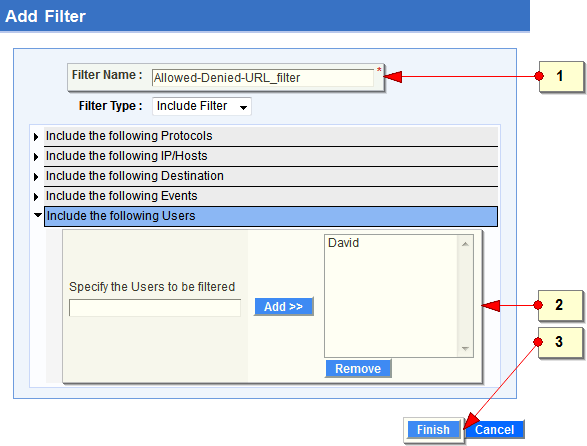 If filter name is not entered, by default ‘_filter’ will be assigned as filter name. Select the filter type as required. Select ‘Include the following Users’ option and enter the user name in the text box. Use the ‘Add >>’ button to add the users for whom report should be filtered. Remove the user using ‘Remove’ button. 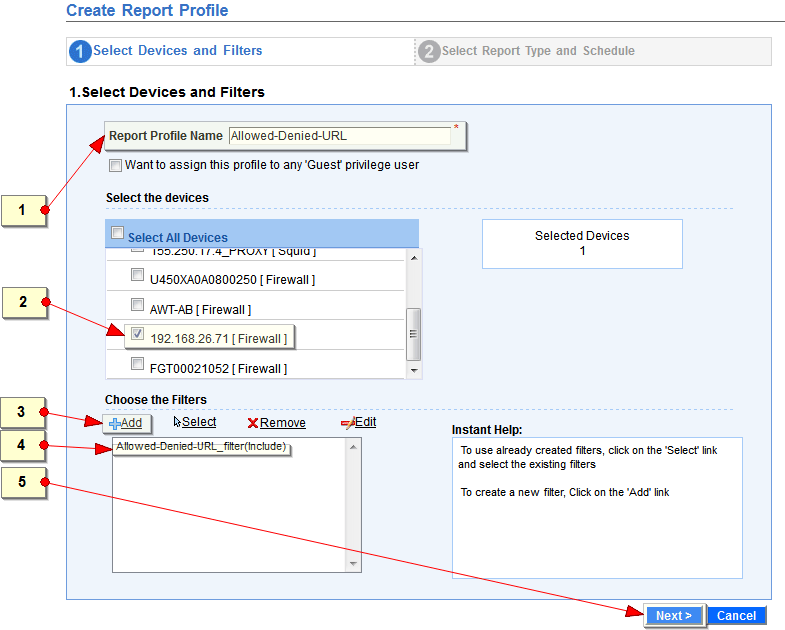 Use the ‘Finish’ button to complete the report filter creation. Scroll down and choose the ‘URL Report’ from the ‘Available Reports’ list, which meets the denied URL report condition. Optionally, if you want to modify the definition of the report type, use the ‘+ Add’ menu link. The report can be emailed to the concerned Administrator if you enable the ‘Email the report’ option and configure the ‘Mail Server’ and recipients email IDs. Use the ‘Preview’ button to have the report preview and Use the ‘Save’ button to save the report profile. Note that this report captures the accessed URLs and denied URLs attempted by one specific user. To get report for multiple users, use the ‘Advance Search’ option. In our subsequent posts we will cover few of the other methods of implementing Internet fair use policy using Firewall Analyzer. The post How companies can implement Internet fair use policy for corporate users? 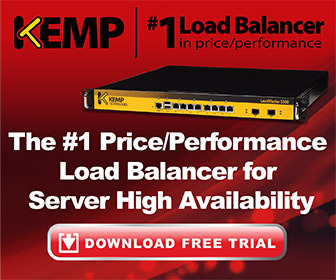 appeared first on ManageEngine Blogs. The original article/video can be found at How companies can implement Internet fair use policy for corporate users?